The National Association of Pilgrim Fellowship (NAPF) and Heritage of Pilgrim Endeavor (HOPE) 2016 conference was held in Detroit, Michigan, June 26 - July 1. We stayed at Wayne State University where we held our worship/programs and met in small groups. 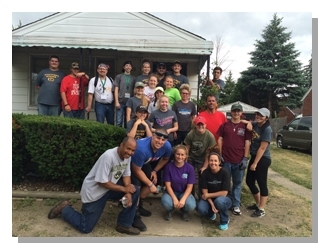 Our mission work was helping throughout the City of Detroit. Urban Development Corportation (UDC) is a nonprofit organization, established in 2002 during the onset of Detroit Michigan's mortgage foreclosure crisis and substantial automotive job losses. Today, UDC's efforts are concentrated on strengthening inner-city Detroit neighborhoods within our targeted area in District 3. 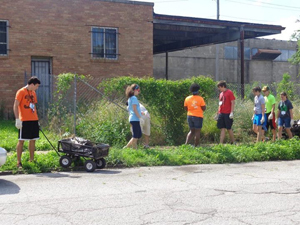 We adopted a 9-block area with the hopes of it serving as a model of how to bring stabilization, revitalization and sustainability to a declining inner-city Detroit neighborhood. An organization that was formed in 1990 dedicated to relieving hunger in metro Detroit and preventing nutritious food waste. What an amazing organization and well all felt a push to increase our numbers every day and felt so in awe of all the wonderful food that was packaged and going out to so many needy families/people in the Detroit area. We were responsible for repackaging fruits, vegetables and meat products into family size portions. We also prepared sandwiches and fruit for their summer lunch program. A Detroit-based agency that works across the city in areas of concentrated poverty providing programs for food, health, housing and jobs. They also collect illegally dumped tires from vacant lots in Detroit and recycle them into indestructible mud mats. Here the groups moved furniture, cleaned, played bingo with the elderly residents and moved many of the tires. 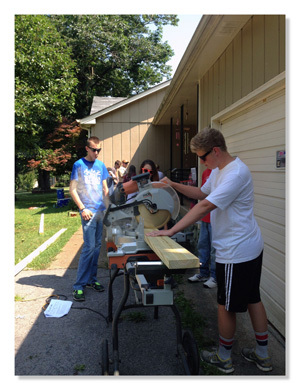 It was truly a rewarding spiritual time with the three organizations that we worked with. Many blessings and an abundance of sharing God's word and His love were given and received. Along with our church conference and mission work, the youth were able to enjoy a couple of fun things Detroit has to offer. We took our sights and cameras to the Henry Ford Museum and Greenfield Village. We also visited the Hitsville USA Motown Museum before heading home. Our three HOPE girls had a wonderful evening with some of the Adult Conference attendees where they danced the night away to a Motown band. Our very own Emily Smith was elected to be a HOPE officer. Her duties will include helping the planning team prepare for the NAPF/HOPE 2017 Conference in Piedmont, GA. The National Association of Pilgrim Fellowship (NAPF) and Heritage of Pilgrim Endeavor (HOPE) 2015 conference was held in St. Louis, Missouri, June 24-29. We stayed at the University of Missouri-St. Louis where we held our worship/programs, met in small groups and had fun in the pool. 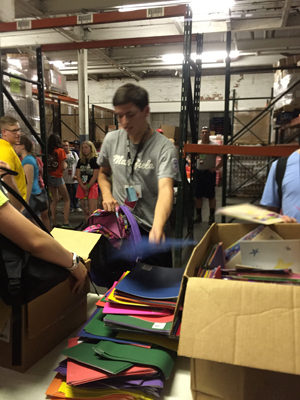 Our mission work was helping out at the Dream Center. The St. Louis Dream Center, an outreach of Joyce Meyer Ministries, is a thriving , multi-cultural, urban church that is literally changing the face of St. Louis community. They help provide food, clothing to the poor, restore beauty to forgotten public areas, share God’s love within the community neighborhoods, parks and schools. The Dream Center has several ministries within their organization: KidzJam, Street Ministry, Food Ministry, Nursing Home, Adopt-a-Block, Loads of Love, New Image Clothing Boutique and our youth were able to help out in every one of those outreach programs along with filling hundreds of backpacks with school supplies, sorting out all donated items in their warehouse, cleaning the Sunday School Classrooms at the Dream Center, and worshipping with the community Sunday morning at the Dream Center church. 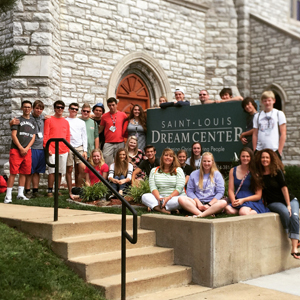 It was truly a rewarding spiritual time with the Dream Center staff and the St. Louis community. Many blessings and an abundance of sharing God’s word and His love were given and received. Along with our church conference and mission work, the youth were able to enjoy a couple of fun things St. Louis has to offer. We took our sights and cameras up on the Arch and spent a fabulously fun time at the City Museum, where even the adults loved being a kid!! Every year the youth attend the National Association of Pilgrim Fellowships (NAPF) which is our church conference/mission trip. 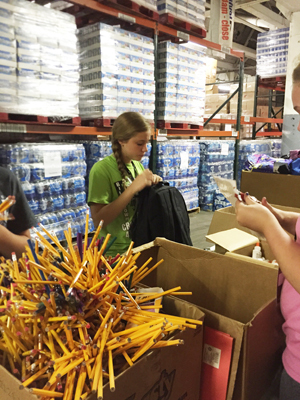 NAPF is for youth who have completed 8th – 12th grade. NAPF allows teens to meet and bond with other Christians from throughout the country and to share their faith in a fun-filled atmosphere. The conference offers meaningful worship time, music and small groups to help teens & leaders grow and connect. Another purpose of our conference is community service & mission work that help strengthen the bond with each other, the community and with God. Heritage of Pilgrim Endeavor (HOPE) offers young adults post high school through age 26 a great opportunity to further grow in faith with peers in an environment similar to NAPF. While still a part of the worship, small groups, and mission work – HOPE promotes closer connection with peers and deeper discussion about their faith through peer-led small groups. 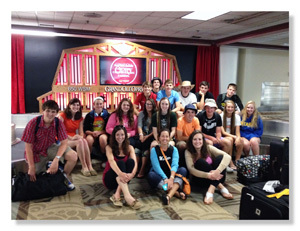 NAPF and HOPE create a genuine, meaningful, and fun atmosphere to grow in faith while creating new friendships!